In 2008, the economy of Iceland, population 320,000, nearly collapsed due to massive fraud and mismanagement by three of its leading banks. In the ensuing years, rather than bail out banks, the country’s people forced their government to arrest the banksters and move toward a more fiscally responsible, nationalistic approach to the economy. Since that time, Iceland has experienced economic growth and improvement of people’s lives. 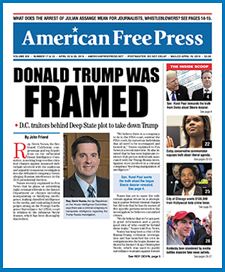 AMERICAN FREE PRESS was pleased to report that story and decided it is time to revisit the situation and learn what has become of the economic miracle. In reality, it has not been all happy times for the island country. The Icelandic people have suffered, but the country continues to show progress despite taking a path that the international bankers claimed would lead to ruin for all. Inflation in Iceland had been as high as almost 20% and is now around 4%. Unemployment has been halved, below 5%. Some debt relief was provided to the financial sector, but nothing like it was in the U.S. and Europe. Currency controls were put in place, which have somewhat stabilized Iceland’s currency, the krona, by forbidding foreign investment by Icelandic companies and preventing foreigners from removing their money from the island nation. Government spending was reduced. Unfortunately, the krona has lost as much as 60% of its value, resulting in massively higher costs of goods and services, and taxes are punishingly high. The economy has shown growth, but inflation is still in the country. In addition, because capital has been locked into the country for over four years, a real estate bubble has developed, fueled primarily by the captive foreign assets. As for debt relief, mortgages in Iceland can be a homeowner’s nightmare and a usurer’s dream. Icelanders are faced with the Hobson’s choice of taking out property loans which are indexed to either the rate of currency exchange or the rate of inflation. In both cases, it is not the interest rate that changes, but the amount of the principal itself. If someone borrows 100,000 kroner under the second, saner scenario, and inflation is 10%, he will owe 110,000 kroner at the end of the year. This makes it very difficult to pay off mortgage debt and own property but is a boon to the bankers. One of the highlights of the Iceland story has always been the country’s alleged willingness to punish and imprison the wrongdoers who bankrupted the country. Certainly, the people demand it, but the facts are disappointing. Some of the bankers were put on trial, as was the former prime minister, Geir Haarde. Some were convicted, and then served only a fraction of their sentences. Haarde was found guilty of a technical charge, but be received no fine or prison sentence. Two CEOs and 14 other bank employees were indicted in March, so hope for progress remains. It is true that Iceland nationalized the banks. But then it privatized them again. End result: two out of three of the collapsed institutions now belong to the creditors. The creditors then sold out to “foreign hedge and vulture funds,” says Bjarnason, so the banking system is no longer controlled by Icelanders. By re-privatizing the banks so quickly, the Icelandic government may have destroyed its chance for true banking reform and punishment of the criminal perpetrators of the financial collapse. The good news is the Icelandic people don’t seem to be taking any of this lying down. Voters in Iceland’s national elections in April tossed out the center-left Social Democrat government coalition, even though it had successfully stabilized the economy to some degree. The center-right Independence and Progressive parties took over 60% of seats in the Icelandic Parliament, promising to “forgive or renegotiate [many mortgages] and to put an end to four years of austerity by lowering taxes, ending capital controls and stimulating foreign investment,” according to a New York Times report. In light of the ups and downs in Iceland, the financial vision of Hungary, which AFP recently reported, must remain uppermost in our minds. It is a beacon beckoning toward freedom and a model for all nations. Readers can be assured that AFP will keep them informed of developments there, as well.